During her noon lunch break, she went to the local park, nibbling a sandwich while glancing at the actions of others. People sat harmlessly on benches, in ones and twos. Some guided dogs along paths, and off paths. Some listened to music with things stuck in their ears, staring into mini-screens before their faces, absorbed in their self-created world sitting there running away from any possible stray thoughts. She came upon a young man who had staked a solitary place on a modest circular area of grass. He held four balls, and was moving them meditatively around with his fingers. A sack lay limp behind him. He stood for a moment looking pensively down at the four balls, weighing them in his hands, two balls clutched in each hand, now moving them slightly up and down. Without warning or obvious preparation, he tossed them up, one at a time, in an arc, ready to move them about through the air. She observed the excitement, enjoying the circular whirl of balls for five, maybe six seconds. One moment they were in the air, trading places, then suddenly the next, with soft thuds, the three balls had landed at the juggler’s feet. 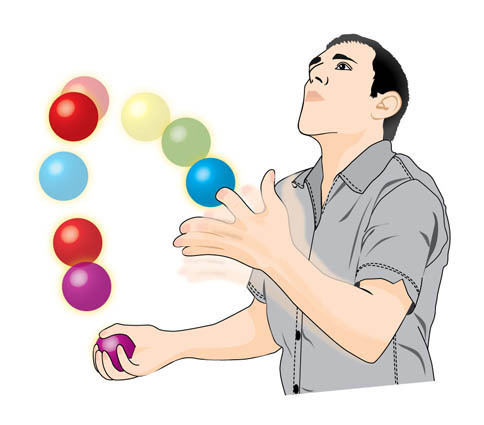 He bent down from the waist, no leg bending, to pick them up, then straightening and without any obvious preparation tossed them up, began juggling, five, six seconds later, three balls, a simultaneous single thud, all at his feet. Again he bent, retrieved, made them dance in the air for their hopeful six seconds, before the three balls, always three balls, equally and at the same time, hit the ground as one at his feet. The juggler did not curse, did not look around in shame, did not recognize any form of public humiliation. He calmly repeated. Picking up, tossing, the inevitable falling. She continued looking from a distance, waiting, sandwich nibbling, half-hoping for a sudden miracle of artistic coordination, some internal click that would allow all the balls to remain in the air, like rapid satellites circling this young man’s head, a triumph, a break-through, foretelling a real true future as a juggler. Three balls again thudded to the ground, and she could no longer take the pain and turned away and walked away and resisted looking back at the eternal hope of mastering a creative act fighting a clear lack of talent. Thud, she heard in the distance back there. Thud.